For some reason, it’s been so long since I’ve had such an obvious scam letter, that getting this yesterday was like receiving a missive from a long lost friend. 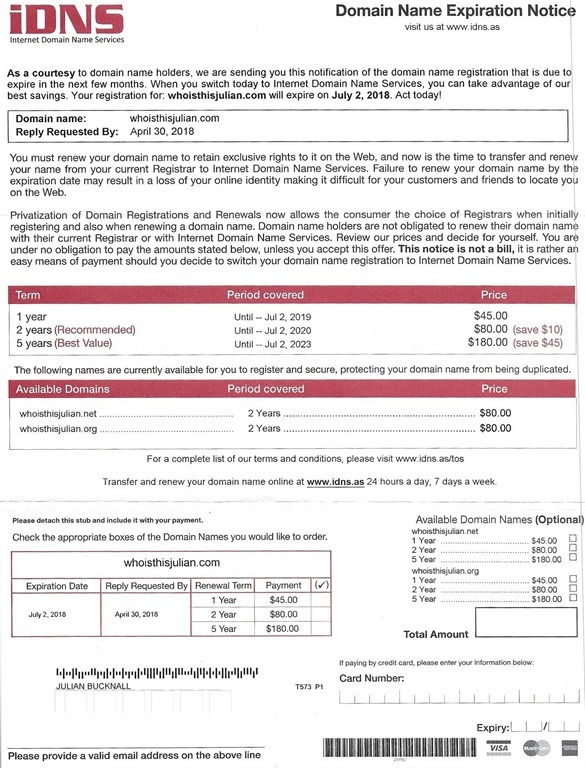 Let’s see… One of my domain names is expiring in July! They’re prompting me to renew! But with them! $45 for a year, or – watch out for these savings! 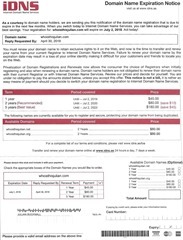 – two years for $80 and saving $10! If I plump for 5 years, I’ll save $45! Wow! Better stop there before I wear out my exclamation mark key! The company name is redolent of the internet too: little-i, capital DNS, where they hope you think of DNS, the Domain Name System, the process by which your browser works out which server to connect to in order to download a web page (it’s the distributed system that converts boyet.com for example to a numeric IP address like 45.40.165.26). But what a weird domain name they have: idns.as. Where’s “.as” when it’s a top-level domain? Answer: American Samoa. Ah. Yet the company is based in Jersey City, NJ. In fact let’s look up their address (924 Bergen Ave, Suite #289, Jersey City, NJ 07306) on Google Maps street view. Must be like some office block right? Yep, in between the Popeyes and the (now defunct) Radio Shack, there’s a UPS Store. That’s it, that’s the address. Nice. The wacky thing about this scam letter is that they accept credit cards. Interesting for two reasons: first, who in their right mind would give such a dodgy company (the BBB gives them an F) their credit card number and expiry date?, and second, what an easy way for someone to get their money back by disputing the charge when they realize they’ve been had. So, all in all, I’ll just take this as a reminder that I will have to renew that domain in a couple of months. But then again, I’ll be getting a reminder from GoDaddy anyway. Shreds letter.